The palm lined, private community of Hope Ranch is a world of its own. One of a widely known Santa Barbara homes, once owned entirely by Thomas W. Hope, was broken up into individual Hope Ranch real estate parcels c. 1925. Many Hope Ranch properties have spectacular views of both the mountains and the ocean. The main road through "the Ranch," is a public street. It begins by the wrought iron Hope Ranch sign that is suspended over the gate at the Las Palmas Drive entrance. It passes by a portion of the private La Cumbre Country Club golf course, past picturesque Lake Laguna Blanca, past sports fields, and then runs adjacent to the private riding trails that are found throughout the ranch. 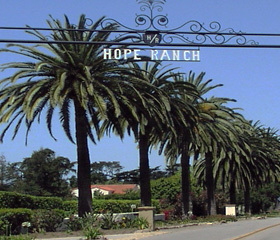 Residents of the Ranch are members of the Hope Ranch Homes Association, which oversees the maintenance and protection of the entire area. Residents also enjoy membership and access to the private beach, tennis courts, horse trails, and security service. A wonderful blend of fine estates and family living, Hope Ranch remains one of the great gems of gracious living in the Santa Barbara area. Updated: 22nd April, 2019 4:38 AM.